The Kiwi originated in China and arrived in the U.S. via Australia. It’s one of our more unusual fruits – brown, fuzzy skin with bright green flesh – possessing a unique tart-sweet flavor. The vines are vigorous, requiring a strong supporting structure. These kiwis require a male and female plant in order to produce fruit. The male is needed for pollenization and bears no fruit. It does, however, pollenize up to eight females. Vincent and Tomuri are very low chill varieties needing only about 100 hours of chilling. The Issai hardy kiwi differs in many respects from the other two. It is self-fruitful and the vine can be grown in Zones 5 to 9, withstanding much colder temperatures than Vincent and Tomuri. In addition, the fruits are much smaller and fuzzless. The hardy kiwi produces earlier, generally fruiting in its second year, whereas the larger fruited varieties usually need 4 years or more. Kiwi blossoms appear in the spring and the fruit is ready for harvest in the fall. We are used to seeing the kiwi appear in a fruit salad, but there are more innovative uses for this tasty fruit. Kiwis can be grilled with fish on skewers, sautéed alongside chicken and can be the main ingredient in desserts. Here’s an idea for a kiwi-red snapper dish. Marinate 1 pound of red snapper for 30 minutes. Broil fish till flaky and golden brown on both sides. Dip slices from two or more kiwis in marinade and grill until just heated through. Does not bear fruit, but pollenizes Ken's Red. One male pollenizes up to eight females. Not a reliable pollenizer for Vincent. Hardy to zone 4, but low chill requirement. Ripe fruit has red skin and very sweet red flesh. Requires Hardy Male for pollenization. Low chill variety, yet cold hardy to zone 4. Pollenizer for Vincent female kiwi. Does not produce fruit. One male can pollenize up to eight Vincent females. 100 hrs. Well regarded, tasty, medium sized, fuzzy skinned kiwi. Low chilling requirement; adapted to southern California. 100 hrs. Pollenized by Tomuri male. 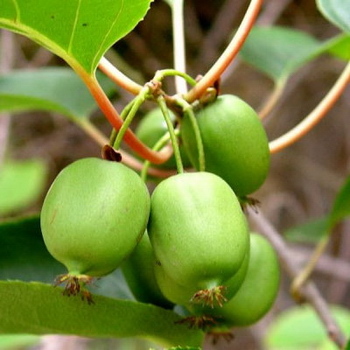 Self-fruitful variety, the preferred hardy kiwi for home planting. Fuzzless fruit, no need to peel. 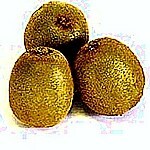 Smaller than the fuzzy kiwi, and usually sweeter; very high in Vitamin C. More winter hardy than Hayward. 3-400 hours.